W. W. Norton & Company, 9780393304572, 299pp. 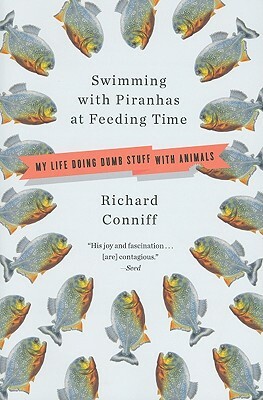 In this thrilling foray into the animal kingdom, Richard Conniff takes readers on an adventure-packed journey as he courts the most dangerous animals and lives to tell the tale. He lets African wild dogs sniff his neck to test the idea that they are vicious man-eaters, sticks his hand in a fire ant mound and does multiple takes for a pretty camerawoman on a television shoot, and flings chicken carcasses into piranha-infested waters to clock how quickly they disappear--before diving in himself. This collection offers a rare chance to go along on these death-defying treks and see life through the eyes of a bona-fide field naturalist.